On a recent Sunday, some friends took pity on the boat-less Travelmarx and took us across the Puget Sound (start point: Shilshole) for brunch in Suquamish on the Kitsap Peninsula just north of Bainbridge Island. We ate at the delicious Agate Pass Café. Afterwards, we took the short walk up the hill to Chief Seattle’s tombstone. Chief Seattle (also spelled Sealth, See-alth, and Seathl) (c. 1780 – 1866) is famous as an important Northwest leader and namesake of Seattle. The chief’s baptismal name was Noah. Suquamish, which means “place of clear salt water” in Chief Seattle’s Lushootsee language, is located in the Port Madison Indian Reservation, home to the Suquamish tribe. 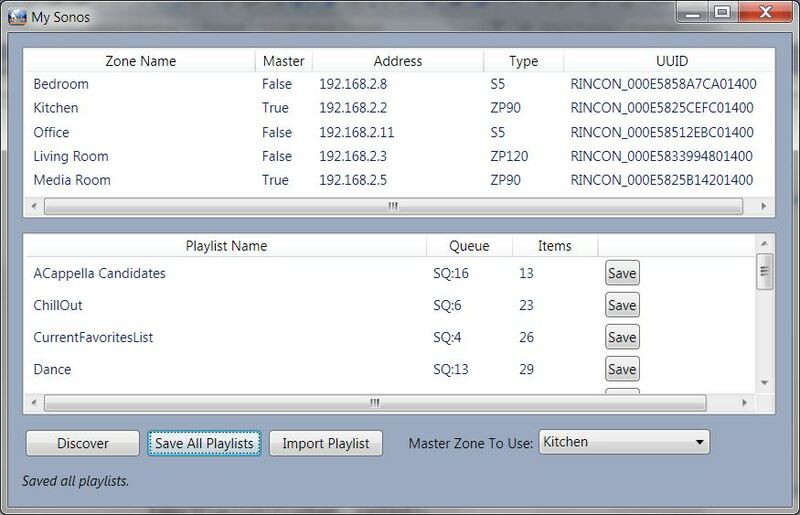 Disclaimers: This is proof of concept WPF application for managing one aspect of your Sonos system: playlists. It doesn’t work flawlessly and you should use care when sending broadcast packets on your network and importing playlists into your Sonos system, both which this application does. Furthermore, we are providing the source code, but not the executable. Add music (either local or from a non-local source like Rhapsody) to the queue. Local = music library in the Sonos documentation. Save the queue as a playlist (also referred to as a saved queue reflecting what it really is). Add some music to it. Save the queue back reusing the same name. The trick to importing a previously exported playlist is to find the SOAP operations that support the actions described above. That’s where Microsoft Network Monitor (NetMon) helps out so you can watch traffic and look at what’s going back and forth between a controller and the UPnP devices (zone players). So, if you use the Sonos Desktop Controller then you can capture the basic SOAP requests shown below – with their device path, SOAP actions, and service parameters. You can then use a UPnP exploration tool like DeviceSpy (discussed in the first of the series of Sonos-related posts) to test these actions. Note, the following queue-based actions are performed on a master zone player. When adding music, the EnqueuedURI parameter depends on what you are importing. The URI must match the type of item being added to the queue. The EnqueuedURIMetaData parameter contains a blob of DIDL which stands for Digital Item Declaration Language and is an XML dialect for MPEG-21. Five examples are shown below for adding different types of items to add to a queue. What is shown below is more for someone who might construct the DIDL XML by hand. In the WPF application developed in this post you don't need to know the exact formats of what goes into the EnqueueURI and EnqueuedURIMetadata parameters when importing and exporting. Update 2011-06-27:: a reader (see comments for this post) discovered that this approach does not work for a ZoneBridge. We did not test for that case so in the code below you should exclude ZoneBridges from the check. Specifically, you could check for BR100 in the Discover_Click method of MainWindow.xaml.cs and exclude that device. Running DeviceSpy many times and studying the output with Net Monitor was the key to figuring out what was going on in the discovery of zones. We started from a post on Code Project which provided the nucleus of the discovery code, but for a different problem. Slowly we evolved the code shown here that behaves well enough for this proof of concept. But, there are times when the discovery process doesn't find anything. It would definitely make sense to have more logic to deal failure of the UDP broadcast. Future work. And the location header is all you need to start working with the zone. Once you have responses from all zones you have the start of a map of the Sonos topology. The Sonos WPF application queries zones with a SOAP message in the body of an HTTP request (POST). This includes sending requests to the following Services. There is one place in this Sonos WPF application where there is an HTTP request (GET) for a page (/xml/device_description.xml). The device_description.xml is used to return the model number (ZP90, ZP120, etc.) and the unique UUID (RINCON_000#####) of the zone. Update 2011-11-15:: a reader/tester (see comments for this post) discovered that large playlists were not correctly saved. After a few hundred items, the playlist items were not fetched. It turns out that a recursive fetch of all the playlist items is needed. See the UPnP.QueryDevice.GetPlaylist method in UPnP.cs. Update 2011-12-20:: After recent release of Sonos, some things worked differently and had to adapt the program. Instead of zone_player.xml to get device info, we now use device_description.xml. Part of rebranding changes? When you use Device Spy, you now see “PLAY:5” and “CONNECT:AMP”. Also added logic for dealing with Zone Bridges. Basically, you can’t query them the same way as you can with other devices. Also added minimal support of m3u playlist generation. Clicking a button next to the playlist name will create a “m3u_playlistname.m3u” file. You may still have to do post-processing on the file. For example, if you home for music files is “//homeserver/music” but you will be using the m3u playlist where the music is homed elsewhere, then you have to change the playlist to reflect this. The release notes for the various versions of this effort are here. Update 2012-01-10:: Make ZoneBridge check less restrictive based on user feedback. Search for just "bridge" instead of "zonebridge". Update 2012-02-05:: V5 Revised the discovery method (UPnP.Discovery.Discover()) by separating the collecting of the broadcast responses from the checking of them. Basically, we made two loops. Seems to perform better and require less overall time to discover. Also, tweaked MX header in discovery to 2 instead of 5. Finally, added time stamp after "Discovered devices..." method to make it easier to see when the last discovery happened. The release notes are here. The V5 version is here. Update 2014-06-22:: Just tried this code on Windows 8 with Visual Studio 2013 and it is working. I moved the project to GitHub. Update 2015-01-18:: Made a code fix to put a try/catch in the FindMaster() method. It was reported that some devices failed in this SOAPrequest. While working on the fix, tried the code in Visual Studio Community 2013 (free development environment). I updated the code at GitHub. In the code for broadcasting a UDP message over a socket (see the UPnP.Discovery.Discover() method) it was tricky to get the “while” loop code to work for the specified timeout and to process responses to the UDP broadcast. There is remove for improvement. Experiment with the best period of time to broadcast. There is a variable called _timeout you can set. In the general SOAP request method (see the UPnP.QueryDevice.SOAPRequest() method) we didn’t realize at first that a response could be spread out over several TCP frames and that you have to keep reading until you reach the end of the data. We got stuck on an error regarding invalid characters in the XML. This post helped set us straight that just because it looks like good XML you still have to check for invalid characters. In the import process (see the UPnP.QueryDevice.ImportPlaylist() method) some shortcuts have been taken. There are replies back from the AddURIToQueue action including FirstTrackNumberEnqueue, NumTracksAdded, and NewQueueLength. In the application developed here, they are not used. Querying for XML nodes in the DIDL-Lite XML took a little time to figure out. You have to define namespaces to find the elements you want. That includes the default namespace. For an example, see the UPnP.QueryDevice.ImportPlaylist() method. The WPF updates to the UI seem to be very slow. Ironically, the UI refreshes quicker when running in debug. There is a message control at the bottom left in the UI that was intended to be updated in a timely manner to let you know what is going on, but it can take some time. Be patient. The export of Sonos playlists to XML or as m3u playlists is done to the same directory where the executable file for the application is located and prefixes XML-exported playlists with “sp_” and m3u playlists with “m3u_”. So if you have a playlist in your Sonos system called “Dance” then the export of the playlist creates sp_Dance.xml or m3u_Dance.m3u. The import of Sonos playlists uses the exact file name (minus the extension) as the playlist name. So if your file on disk is Jazz1.xml then the playlist after imported (and hopefully successful) becomes just “Jazz1”. There is not import from m3u. You can have two Sonos playlists with the same name. They will have different queue names, e.g. SQ:15 and SQ:20. The application developed here assumes unique playlist names so exporting will overwrite another exported file with the same name. Additional code to deal with this case could be easily added, be we haven’t done it here. This application does not provide sorting of table columns in the UI. When exporting you must select a master zone to send the clear/add/save queue commands. There is a dropdown box in the lower right of the UI that allows you to select a master. Load the project that includes the WPF application and build the release executable. Wait for all the zone and playlist information to come back. Change the name of the file to something like “test.xml”. Select a master zone that you want to work with. Check that the playlist got imported into your Sonos Music system. MainWindow.xaml (shown below) The XAML markup code that describes the main window UI. There is only one window in this WPF application. ManWindow.xaml.cs (shown below) The code-behind for the main window that handles events from the UI. SonosWpfApplication.ico The icon for the WPF application. The MainWindow.xaml file references it. UPnP.cs (shown below) The code that supports discovery and all other device queries. App.xaml / .xaml.cs The application XAML and code-behindthat calls the main window. It was not modified from the default Visual Studio version when the project was created. app.config The application configuration. Ensure that sku=”.NETFramework, Version=v4.0”. Properties\AssemblyInfo.cs Modified to reflect the details of this application. This can be changed as needed. <ListView Name="ZoneList" Height="150" HorizontalAlignment="Left" Margin="12,12,0,0"
<ListView Name="PlaylistList" Height="160" HorizontalAlignment="Left" Margin="12,12,0,0"
<ComboBox Name="MasterZoneDropDown" Grid.Column="4" Height="23" HorizontalAlignment="Left"
/// Processes the button click event when saving one playlist. /// Processes the button click event when saving all playlists. /// Processes the import button click. /// Processes the discover button click. /// Gets a valid file name, making sure not bad characters get in the name. /// Helper method to avoid typing the same two lines many times. /// Compares two zones to determine if they are equal. /// Compares two playlists to determine if they are equal. /// Extension method to deal with refreshing UI element in WPF xaml. using System.Xml.Linq; // Be sure to set "Target framework:"  to non-client, e.g. framework 4.0. /// The Discovery class does the UDP broadcast and holds the Sonos topology info in various dictionaries. // Discovery parameter that may need to be changed. // Define properties and backing objects. /// Sends a UDP package over the specified broadcast IP and port and waits for responses. // Are multiple sends needed? Is sending one broadcast sufficient? _zoneTable.Add(loc, ""); // Will fill in zone friendly name later. /// 1. Queries (SOAP) zone attributes to get zone friendly name. /// 2. Queries (HTTP) zone player xml to get zone type and ID. /// 3. Queries (SOAP) zone transports to see if zone is a master. /// 4. Queries (SOAP) zone content directory to get playlist list. /// 5. Queries (SOAP) zone content directory to get one playlist's content or a count of items. // Properties and backing objects. /// Get attributes for each zone in the Sonos topology. // Query to get zone attributes. /// could use this xml to figure out the friendly name of the zone but we do that elsewhere. /// Iterates through zones and figures out if the zone is a master. // It was reported that some devices throw an error as reported by a reader, adding try to catch this. /// Gets all playlists defined for the Sonos topology. // Get playlist items recursively. // Report on items written? /// Imports playlist content from a string into a master controller queue. // Process return parameters to provide info about has been put into queue? // are in queue in master zone and can be manually saved. name = name.Substring(0, Math.Min(20, name.Length)); // Limit on playlist length. /// Gets the response to an HTTP request. //Get the response handle, no response yet. /// Gets the response to a HTTP request with SOAP body. // Open  a stream for writing. Close. /// Removes junk from an XML string that doesn't belong there. /// Would be best to follow advice in link and build functionality into StreamReader.